The weather forecast for Titan? Cloudy, hazy, and cold — just like every other day! 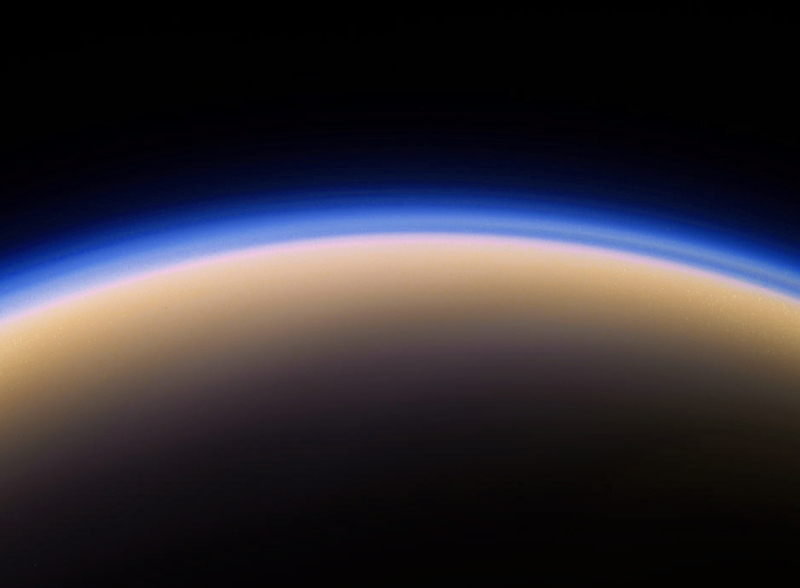 The image here is a color-composite made from raw data captured by Cassini during a flyby on April 7, 2014, and it shows a look at the two main features of Titan’s atmosphere: a thick orange “smog” made of organic compounds created by the breakdown of nitrogen and methane by UV light, and a wispy blue upper-level haze composed of complex hydrocarbons. Cassini was approximately 19,076 miles (30,700 km) from Titan when these particular images were captured. Titan is the only moon in the Solar System that has a substantial atmosphere (and not just a thin exosphere of ions and dust)… in fact, Titan’s atmosphere extends ten times higher in altitude than Earth’s! Due to its atmosphere’s opacity and distance from the Sun (about 900 million miles) standing on the surface of Titan even at midday would seem like a deep twilight on Earth… dark and cold, with average temperatures near 300 below zero F. And that’s if it doesn’t start raining liquid methane on you. Learn more about Titan’s atmosphere and the Cassini mission here. Note: the image was composed of images acquired in green, blue, and violet filters and thus needed to be edited to created the “true-color” version seen above. Any discrepancies are my own. Image was also rotated -90 degrees.